Boston Photography Workshops-News-New affordable prime lens. Great for beginners. New affordable prime lens. Great for beginners. For students who want to try a "fixed" lens at an affordable price, this lens is a great place to start. A large aperture means more light can enter the camera in an instant, allowing for faster shutter-speeds in dark situations. 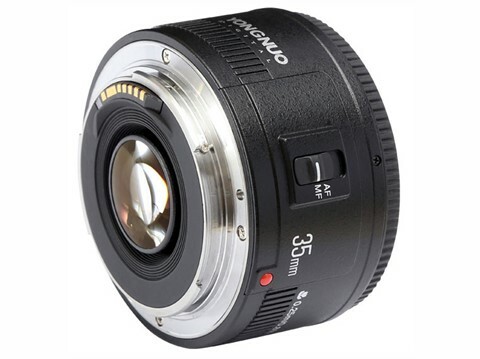 China-based manufacturer Yongnuo has produced what looks like a near-clone of Canon's well-liked EF 35mm f/2, a lens that dates back to 1990. With a couple of exceptions (one of which being the brand name on the front of the lens) the Yongnuo lens certainly looks very similar to Canon's 25-year-old prime. The Yongnuo 35mm f/2 covers a 56mm equivalent focal length on an APS-C body and comprises 7 elements in 5 groups, just like the original. But rather than the Canon's 5-blade aperture, Yongnuo offers 7 blades. Another key difference - whereas Canon's lens still costs around $250 used; we understand that the new Yongnuo 35mm F2 is likely to cost around $115. Keep an eye on Yongnuo's official eBay and Amazon stores for more information.